Glory be to He who watches over, never leaves anything undone, or is neglectful Glory be to He who is Merciful, never does a thing in haste. Glory be to He who is vigilant, never forgets one thing over another. Glory be to He who is alert and steady, never is engrossed with a thing so as to overlook another. Glory be to Allah, (all) praise belongs to Allah, there is no god save Allah, and Allah is the greatest. Glory be to Thee, Glory be to Thee, Glory be to Thee, O the Mighty, forgive my sins, one and all, altogether. O Allah send blessings on Muhammad and on the children of Muhammad. Glory be to Him Who watches over, never leaves anything undone, or is neglectful. Glory be to Him Who is Merciful, never does a thing in haste. Glory be to Him Who is vigilant, never forgets one thing over another. Glory be to Him Who is alert and steady, never is engrossed with a thing so as to overlook another. Glory be to You! Glory be to You! Glory be to You! O All-great, forgive my grave sins. O Allah, (please do) send blessings to Muhammad and upon his Household. Almighty Allah will forgive seventy thousand sins of those who offer this prayer in the previous form. and do not substitute another in my place. The First Night Prayer: Four units with S£rah al-F¡ti¦ah once and S£rah al-Taw¦¢d fifteen times. 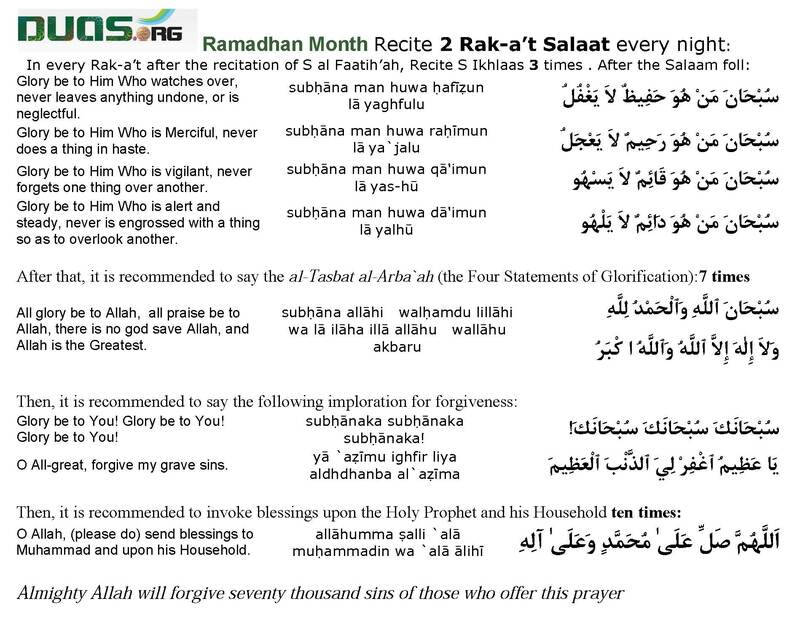 The Second Night Prayer: Four units with S£rah al-F¡ti¦ah once and S£rah al-Qadr twenty times. The Third Night Prayer: Ten units with S£rah al-F¡ti¦ah once and S£rah al-Taw¦¢d fifty times. The Fourth Night Prayer: Eight units with S£rah al-F¡ti¦ah once and S£rah al-Qadr twenty times. O Allah, (please do) bless Mu¦ammad and the Household of Mu¦ammad. The Sixth Night Prayer: Four units with S£rah al-F¡ti¦ah and S£rah al-Mulk (No. 67). The Seventh Night Prayer: Four units with S£rah al-F¡ti¦ah once and S£rah al-Qadr thirteen times. All glory be to Allah. The Tenth Night Prayer: Twenty units with S£rah al-F¡ti¦ah once and S£rah al-Taw¦¢d thirty times. The Eleventh Night Prayer: Two units with S£rah al-F¡ti¦ah once and S£rah al-Kawthar (No. 108) twenty times. The Twelfth Night Prayer: Eight units with S£rah al-F¡ti¦ah once and S£rah al-Qadr thirty times. The Thirteenth Night Prayer: Four units with S£rah al-F¡ti¦ah once and S£rah al-Taw¦¢d twenty-five times. The Fourteenth Night Prayer: Six units with S£rah al-F¡ti¦ah once and S£rah al-Zalzalah (No. 99) thirty times. The Fifteenth Night Prayer: Four units; in the first two units, S£rah al-F¡ti¦ah is recited once and S£rah al-Taw¦¢d repeated one hundred times. In the last two units, S£rah al-F¡ti¦ah is recited once and S£rah al-Taw¦¢d repeated fifty times. The Sixteenth Night Prayer: Twelve units with S£rah al-F¡ti¦ah once and S£rah al-Tak¡thur (No. 102) twelve times. The Eighteenth Night Prayer: Four units with S£rah al-F¡ti¦ah once and S£rah al-Kawthar twenty-five times. The Nineteenth Night Prayer: Fifty units with S£rah al-F¡ti¦ah and S£rah al-Zalzalah (No. 99). The Twentieth to Twenty-Fourth Nights Prayer: At these nights, it is recommended to offer an eight unit prayer with any selected S£rahs. The Twenty-Fifth Night Prayer: Eight units with S£rah al-F¡ti¦ah once and S£rah al-Taw¦¢d ten times. The Twenty-Sixth Night Prayer: Eight units with S£rah al-F¡ti¦ah once and S£rah al-Taw¦¢d one hundred times. The Twenty-Seventh Night Prayer: Four units with S£rah al-F¡ti¦ah once and S£rah al-Mulk. If this is impossible, replace S£rah al-Mulk with repeating S£rah al-Taw¦¢d twenty-five times. According to my own readings in the books of narrations, I found that the prayer of the twenty-eighth night of Rama¤¡n consists of six units with S£rah al-F¡ti¦ah once, ªyah al-Kurs¢ ten times, S£rah al-Kawthar ten times, and S£rah al-Taw¦¢d ten times. After accomplishment the same aforementioned invocation is repeated one hundred times. The Twenty-Ninth Night Prayer: Two units with S£rah al-F¡ti¦ah and S£rah al-Taw¦¢d twenty times. Note that each two units of all of the aforementioned prayers should be separated by the Tasl¢m statement.